i was thinking of just keeping the fly spray from yesterday (or rather, giving it away) but since the boots i ordered don't fit Aramis, guess i'm just going to have to deal with Dover customer service! i can't remember if i mentioned i bought a new bridle last weekend, but i used it for the first time today... and it fits great and looks snappy :D slowly but surely collecting all the schtuff i need for the fancy pants dressage show next month! today's polish is Sation Blue Sky's The Limit. it's a dusty blue creme (on the light side of the mid-tones) with a great formula. blues like this can be chalky or streaky, but this one is neither! it's a little patchy on coat one, but evens out to perfection on coat two. it dries shiny on its own, but i prefer it with a shine topcoat to make it extra glossy (and aid in drying!). 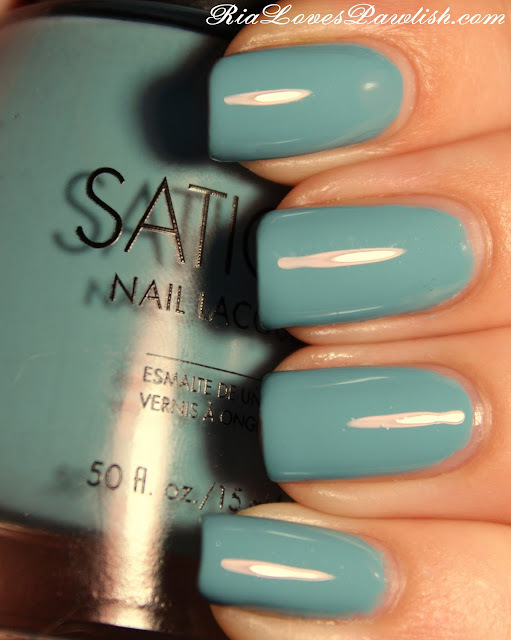 two coat Blue Sky's The Limit, one coat Seche Vite.